Shield LLC is a new company based in the Northwest. They just ran a successful Kickstarter campaign with their first product, the Shield Face Mask that has a unique nose piece, which allows the face mask to fit any face. 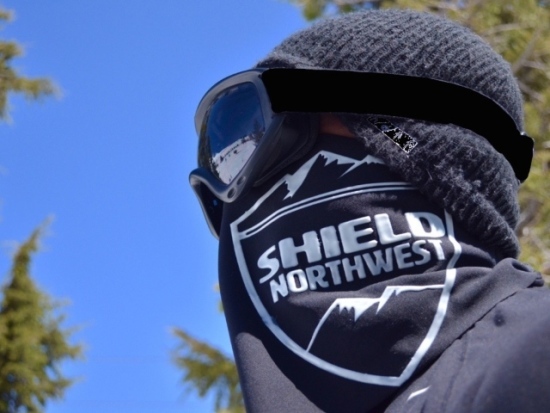 The Shield Face Mask is designed unlike most traditional face masks, which are typically "tubes" of fabric. Shield is cut into a V-shape, which allows unconstricted coverage of the lower part of the face and neck with minimal fabric. The stainless steel, bendable nose inserts are what set Shield apart. These allow you to set the face mask onto your nose and customize how tight or loose you want it. Just pinch the inserts and take off on whatever cold weather adventure you're into. Shield will stick with you through rough terrain, fast movements and even falls. You won't find Shield on the market just yet, but I included it because I like the design--the V-cut and nose inserts. Check out Kickstarter for more information. There are a lot of great cold weather gear manufacturers out there (check out one, Under Armour, profiled below) that put out a lot of great cold weather base gear. I decided to profile PODZ, because their upper body base puts a little spin on the traditional design. 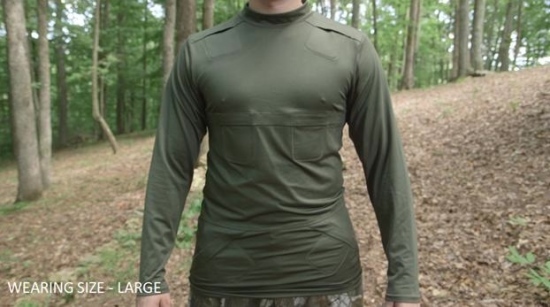 PODZ Gear has its name, because the design of this thermal long sleeve shirt features pods that hold heat warmers. The pods are arranges along the lines of major blood vessels and are designed to hold PODZ Gear heat packs. Not only are you getting a base that helps to retain your own body heat, you get added heat from the heat packs. Like the Shield Face Mask, the PODZ team has run a Kickstarter campaign. In fact, they've run a few (the last in the Spring of last year), and I admire their persistence. The point is, you won't find this gear on the market. My guess is that you'll have to contact the PODZ team directly (find that info on Kickstarter). Under Armour is a leading name in athletic products and activewear, and they continue to set themselves apart from competitors with innovative technology. 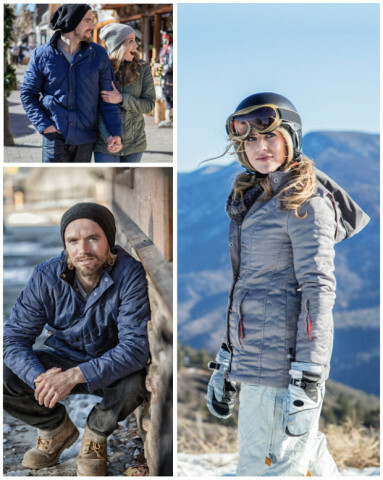 Their line of ColdGear employs some of that innovative technology to keep you warm while you stay active. They produce both tops and bottoms, but we're going to take a look at the ColdGear Tights or Leggings. 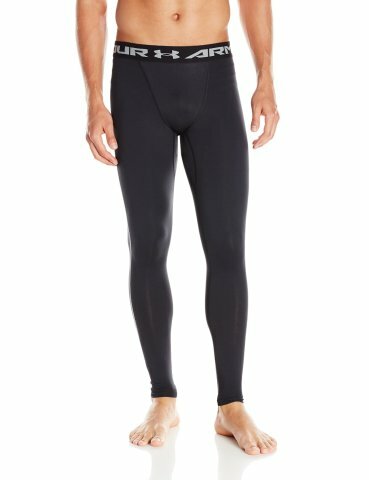 Under Amour's line of ColdGear Tights includes a variety of options in different styles. There's the regular ColdGear, there's ColdGear Infared, ColdGear Tactical, ColdGear EVO and more. The EVO ColdGear construction employs a fast-drying exterior and a brushed, heat-trapping interior. The Infared technology utilizes a soft, thermo-conductive inner coating to absorb and retain your body heat. And Under Armour's signature Moisture Transport System allows sweat and moisture to be wicked away. You can check out Under Armour's site for more information, or hit up Amazon to order a pair of the ColdGear Leggings. When you're picking a jacket that will allow you to brave the cold during outdoor activities, you will usually either sacrifice a bit of warmth for mobility or a bit of mobility for warmth. You either go with the bulky jacket that keeps you super warm or the light jacket that may not keep you as warm, but allows you to move. With the ThermalTech Solar Powered Jacket, you can have both warmth and mobility. This jacket employs ground breaking solar technology that keeps you warm without the bulk. ThermalTech's fabric is made of stainless steel thread--that's right, stainless steel thread. Most thermal wear traps your body heat and so keeps you warm with your own warmth. The ThermalTech jacket's fabric soaks up heat from the sun and artificial lighting to give you an extra heat source. This line of jackets is also incredibly lightweight, especially considering you're walking around with a cloak of metal. The fabric is also surprisingly breathable. And though you're getting the most innovative tech in this jacket, you won't look like you're sporting some jacket from the future. ThermalTech jackets are stylish and come in a variety of colors. Find out more, including how to get your own on the ThermalTech IndieGoGo site. Gloves are often similar to jackets in that you tend to sacrifice movement for warmth and vice versa. 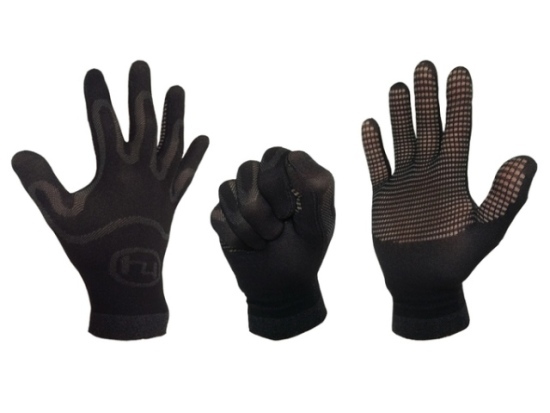 FLUX Gloves, from HY Athletic, like the ThermalTech jacket, give you both mobility and warmth. In fact, HY Athletic claims that these gloves are "the world's best sports gloves." The FLUX Gloves are meant to be running gloves, but of course you can use them when you're not running. The problem that FLUX Gloves solve is that of hot and cold hands when running. When you're just warming up, your hands tend to be cold, sometimes even inside gloves. But, when you start running, they get warm and are sometimes too warm for the glove. There's also the problem of warmth v. mobility, as I mentioned. With FLUX Gloves, you have climate control in the palms of your hands, literally. The design of the FLUX Gloves features air-permeable mesh on the palms and inside fingers of the hands. When you close your hand, in a fist, the mesh is unexposed, trapping heat and keeping your hands warm. When you open your hands, the mesh is exposed and heat is released. This is one of the simplest solutions I've seen for controling the climate of your cold weather gear. You can find out more on the HY Athletic site or on the FLUX Gloves Kickstarter page. There are a ton of cold weather socks on the market, designed especially to keep your feet warm. Some allow the feet to breathe more, some are water-proof, some are made of new fabrics that retain heat better. Perhaps the top-of-the-line-best cold weather and water-proof socks are the Rocky Gore-Tex Socks. Before I even start in on how awesome these socks are, I'll warn you that you will definitely pay for all of the benefits you get in these socks. 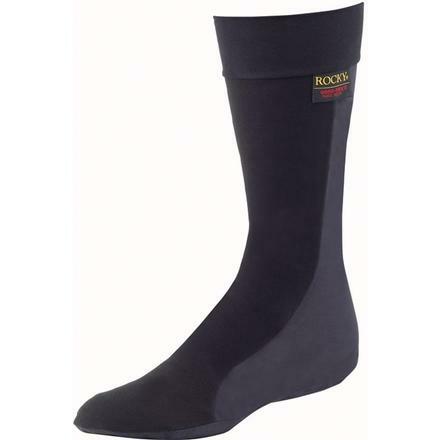 The Rocky Gore-Tex Socks were made especially for cold, wet weather. They are lined with Gore-Tex fabric, which guarantees your feet will not only stay dry, but be able to "breathe." The problem with most water-proof socks is that they either suffocate your feet or aren't well insulated. Gore-Tex solves both of those problems. And these socks have an abrasion-resistant outer layer, wich ensures you'll be wearing them for a long time. You can find out more on the Rocky site, or order your own on Amazon. I realize some of these products may be hard to find or order, but imagine if you could wear this cold weather outfit I've assembled. You'd be guaranteed to stay warm and mobile during any winter weather activity. Oh No, The Acid Monster™ Is In My Coffee Again!